Every year, the SeaDoc Society funds prominent scientists to conduct important research in the Salish Sea. Proposals for this year’s projects’ are due February 22 by 5pm. SeaDoc works to ensure the health of marine wildlife and their ecosystems through science and education and does not take policy positions nor serve in an advocacy role. This year the SeaDoc Society requests proposals only for projects that scientifically address one of the four priority topics below. Junior SeaDoctors’ mission is to inspire and mobilize youth for a lifetime of ocean literacy, stewardship, and sustainable Salish Sea citizenship. We achieve this mission through three tributaries: 1) JuniorSeaDoctors.com, a website and club for ocean education and community stewardship, 2) National and Provincial standards-based curriculum for grade 5 teachers, based on our book, Explore the Salish Sea: A Nature Guide for Kids, and 3) Kids on the Beach, a template and guide for educators from schools, Tribal and First Nations, government agencies, NGOs, citizen science programs, and community volunteers to support student projects in science, technology, engineering, art, and math (STEAM) that help inform policy, restore habitat, and educate the community. Every two years, the SeaDoc Society Awards the Salish Sea Science Prize to a prominent scientist or team of scientists whose work has resulted in the marked improvement of management or policy related to the conservation of marine wildlife and the Salish Sea marine ecosystem. Non-scientists who have used science in a substantial way to improve management or policy related to healing the Salish Sea also will be considered. This is the only award of its kind. The recipient(s) do not need to be a resident of Washington or British Columbia as long as their scientific efforts or use of science have led to measurable impacts on the Salish Sea ecosystem. 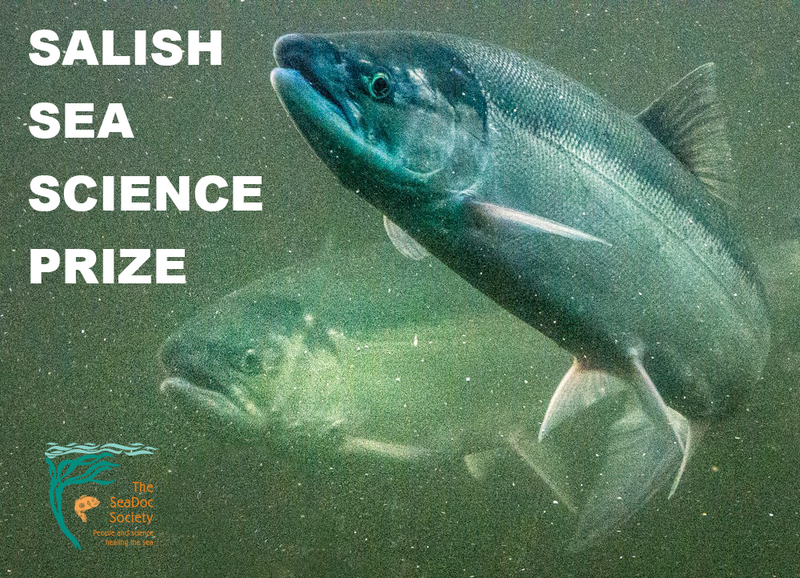 The $2,000 prize comes with no strings attached and is designed to highlight the importance of science in providing a foundation for designing a healthy Salish Sea ecosystem. This award is given in recognition of and to honor Stephanie Wagner, who loved the region and its wildlife. In 2009, the SeaDoc Society awarded the first ever Salish Sea Science Prize to Ken Balcomb for his research on the population dynamics of southern resident killer whales. His annual census work was the basis for the population assessments that ultimately led to the Canadian and US listing of the southern resident killer whale community as endangered and served as a foundation for our understanding of resident killer whale longevity, toxics loading, and the implications of disease on the long-term viability of this population. In 2011, the Salish Sea Science Prize was awarded to John Elliott for his work documenting the high levels of forest industry derived pollutants, dioxins and furans, in marine birds as well for his work documenting the deleterious effects of these toxins on reproduction and embryonic development in multiple bird species. In countless meetings and presentations, Elliott worked with industry and regulators to communicate this science and in so doing, influenced subsequent national and international regulations that halted the use of molecular chlorine bleaching, and restricted the use of chlorophenolic wood preservatives and anti-sap stains. In 2014 the Northwest Straits Foundation received the prize for scientifically quantifying the impact of derelict fishing gear and the benefit of removal. A peer-reviewed manuscript demonstrated the importance of escape cord for reducing Dungeness crab mortality, which spurred Marine Resource Committees to increase efforts to educate recreational crabbers on this topic. Another manuscript quantified the impact of lost nets on marine species helping funders and policy makers to further support net removal. The additional scientific documentation of drop out and decomposition rates showed that early impact figures were actually gross underestimations as they did not account for the short life of carcasses in a net and the sometimes decades of killing that many of these nets had done prior to removal. Moreover, that same work documented a cost-benefitratio for net removal at 1:14.5, demonstrating that derelict net removal not only benefits marine species, but also is cost-effective. In 2016 the prize went to a group of NOAA scientists (Drs. Jenifer McIntyre, David Baldwin, and Nathaniel Scholz) who's research on copper and its affect on salmon was instrumental in the passage of landmark legislation in Washington State to phase out the use of copper and other metals in motor vehicle brake pads. This action will benefit salmon recovery and reduce the loadings of toxic metals to the Salish Sea by hundreds of thousands of pounds each year. Nominations The SeaDoc Society requests that members of the community nominate highly deserving award candidates. All nominations must be sent electronically to SeaDoc Science Director Joe Gaydos (jkgaydos@ucdavis.edu) by December 20, 2017. Nominations must be in the form of a narrative (2 pages or less, Times New Roman 12 point font) describing the nominee’s work and the impact of that work. Please provide the nominee’s affiliation, address, email address and phone number. Be sure to describe how the scientist’s (or team of scientists’) efforts have resulted in tangible improvements in management or policy related to the conservation of marine wildlife and the Salish Sea ecosystem. Or, if you are nominating a citizen or group who has used science in a substantial way, be sure to describe what science they used and how it led to improved management or policy. Specific reference to peer-reviewed manuscripts or studies conducted that produced the important and pivotal information must be cited. Please also include the names and contact information for two external referees who can vouch for the role that this scientific work played in effecting positive ecosystem change or the use of scientific work to improve Salish Sea management or policy. The SeaDoc Society will consider all nominees and select a prizewinner. This is not a lifetime achievement award. Selection will be based on the nominee’s production of valuable science that informed management or policy - or - for using science to improve management or policy related to the conservation of marine wildlife and the Salish Sea marine ecosystem. The decision will be made public when the Prize is awarded. The Salish Sea Science Prize will be given at the April 2018 Salish Sea Ecosystem Conference in Seattle, WA (http://www.wwu.edu/salishseaconference/). The SeaDoc Society is a program of the Karen C. Drayer Wildlife Health Center, a center of excellence at the UC Davis School of Veterinary Medicine. We fund and conduct research and work to ensure that managers and policy makers use science to improve the health of the region’s marine wildlife and ecosystem. Since 2000, the SeaDoc Society has had a regional focus on designing a healthy Salish Sea. For more information or to sign up for free SeaDoc monthly updates, Wildlife Posts, and calls for proposals visit www.seadocsociety.org.